Join us at MORRELL's BBQ the last Thursday night of each month for Live Stand-Up Comedy hosted by comedian Corey Manning, featuring nationally touring stand - up comedians as well as a few local favorites, for a night of laughter!! Headliners from HBO's, COMEDY CENTRAL, AXS LIVE AT GOTHAM, STARZ and more. Doors open at 7 pm Show starts at 9 pm Sharp! NOTE: Prices Will Vary For SPECIAL ENGAGEMENT SHOWS. Artist Subject To Change Without Notice. FUNROOMCOMEDY CLUB turns one of your local favorite night spots into a premier spot for all things comedy. 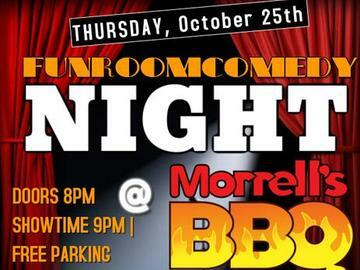 October's show will take place at FUNROOMCOMEDY CLUB at MORRELL'S BBQ - 577 Washington St, Stoughton, MA. It's not just comedy, it's FUNROOMCOMEDY.COM! !